The image of a newly completed boulevard with lights. Street lighting improves pedestrian visibility and personal security. On streets with lots of trees, street lighting scaled to pedestrians (low lights) illuminates the sidewalk even after the trees grow big and tall. Street lighting improves safety by allowing pedestrians and motorists to see each other. It also adds to personal safety and aesthetics. Two-sided lighting should be considered along wide streets, and it is especially important to provide lighting at the crossings. Lighting can also be helpful along streets adjacent to the school grounds to minimize school vandalism and improve security. While most school walking activity occurs during daylight hours, the morning school trip in the middle of winter often occurs during hours of darkness, and many school activities occur during nighttime hours. Lighting along streets, especially at crosswalks, that more clearly illuminates areas of pedestrian activity to increase motorist visibility and improve nighttime pedestrian security. Better street lighting can reduce nighttime pedestrian crashes and increase the vision and awareness that drivers have relative to pedestrians (Pegrum, 1972; Freedman et al., 1973). Increases actual and perceived pedestrian safety and comfort. Costs vary widely depending on materials used, lighting design, utility service agreements and other factors. 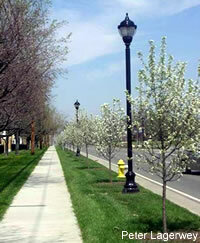 However, a general cost estimate is $2,000 to $3,000 per streetlight (Bushell, Poole, Zegeer, Rodriguez, 2013). Design issues regarding height and existing objects, such as trees. Number of nighttime pedestrian crashes. Percentage of all pedestrian crashes that occur at night. Increased pedestrian activity and reduction in crime.